Between 1946 and 1949 the BBC broadcast fourteen productions from The Intimate Theatre, a modest repertory house in Palmers Green. (There was also a fifteenth Intimate Theatre production presented from Alexandra Palace.) These outside broadcasts from London N13 were a significant element in the schedules of the returning television service. Yet the stage productions had usually benefitted from only a week’s rehearsal before they were transmitted live by three cameras (which themselves seem to have been afflicted by frequent breakdowns). The quality was patchy, at best, and of the 1948 transmission of The Shop at Sly Corner the television producer wrote, ‘the performance itself was indifferent and there was some very bad miscasting’ (Campbell Logan, ‘Camera report’, 9 April 1948, WAC T14/593/2). But the members of the Theatrical Management Association (TMA) were preventing the BBC from having access to more prestigious theatres. As a consequence, the broadcasts from The Intimate Theatre were the most significant engagement between the London stage and television in the immediate post-war years. This post, which is the first of three, considers both the potential and the problems of the ‘Intimate’ relationship. Over the next three and a half years, The Intimate Theatre – in traditional rep fashion – staged a new show almost every week. By August 1936 Clements’ group was attracting a committed local audience and he was sufficiently confident to make extensive interior alterations to the hall and to consider ‘a similar experiment in another part of London’, although this seems not to have materialised (‘Repertory in North London: a successful venture’, The Times, 5 August 1936, p. 10). On 15 July 1939 the Intimate Theatre company was also presented by BBC radio in an adaptation of Hugh Walpole’s The Cathedral. My knowledge of the early Intimate Theatre is derived from Intimate Memories: The History of the Intimate Theatre, Palmers Green written by Geoff Bowden (Westbury: The Badgers Press, 2006). Bowden’s admiring study is packed with titles and dates, photographs and anecdotes, and it takes the story of the Intimate right through to its date of publication. Fourteen of its two hundred-plus pages are devoted to what are excitedly described as ‘The Television Years’. Much of Bowden’s information for this period comes from the three Intimate Theatre OB production files in the BBC Written Archives Centre (T14/593/1-3), on which these posts also draws heavily. It is not clear from the production files how the first broadcast from the Intimate came about. In the final year of the pre-war television service, the BBC had undertaken fourteen outside broadcasts from central London theatres, starting with a transmission of J. B. Priestley’s When We Are Married from the St Martin’s Theatre in November 1938 (on which, see my post From the London Theatre, 1938-1939). But when television began again in June 1946 the TMA was unwilling to allow the return of cameras to the West End (see Asa Briggs, The History of Broadcasting in the United Kingdom Volume IV: Sound and Vision, Oxford: Oxford University Press, 1979, p. 207). 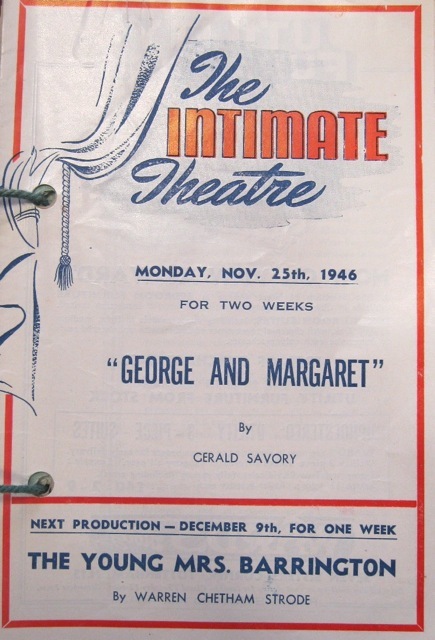 The Corporation’s commitment to the relationship with the Intimate over the next three years, despite the many difficulties, demonstrates how important live theatre played before an audience was to the BBC, even if the productions had to come from a house mounting them in just one week in one unchanging set. It was an excited and rather tense audience that filled the theatre well before time for the curtain raising. Up in the circle was installed part of the mechanism of the wonderful trick of television; in the centre, three massive cameras, of weird design to the untechnical eye, and at either end a group of huge floodlights. The BBC and Fred Marlow had started talking about a broadcast from the Intimate in October. Marlow was paid £59 as a facility fee, from which he had to pay the cast, and the copyright fee for the play was £31. Easily the most substantial item in the £333 6 shilling budget was the £150 charge paid to the Mole, Richardson company for the lighting and generator. Marlow agreed that instead of continuing with his usual one-week turnaround he would keep a production on for a fortnight, so that it could be seen by the production team on its opening night and appropriate preparations made for a broadcast on the Monday evening eight days later. Marlow most certainly did, and inside the month the BBC outside broadcast van was once again parked alongside the Intimate for a transmission on 30 December 1946 of the Broadway comedy Junior Miss by Jerome Chodorov and Joseph Fields. Part two of this series of posts (which is appearing rather later than I intended) will consider that production and those that followed, while part three will examine the difficulties on which the BBC’s Intimate relationship eventually foundered.